The Anglo-Belarusian Society is happy to invite its members and friends to the annual Mother Language Day celebration. This year it will be organised in cooperation with the Belarusian Sunday School. 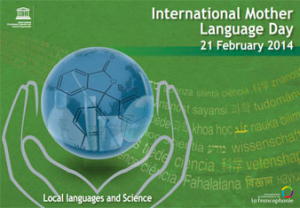 The event will mark the UNESCO Mother Language Day. All languages are welcome and particularly Belarusian and English. The celebration will start on Saturday 21 February 2015 at 2 pm at the Belarusian Cultural Centre in Finchley at St Cyril’s Belarusian Religious and Cultural Centre (Marian House, Holden Avenue, London N12 8HY). Adults and children will be asked to read their favourite poems in Belarusian, English or another language (no need to learn it by heart!). There will be prizes for the best reading. Refreshments will be provided throughout the proceedings – contributions of food and drink will be very welcome. This is a great occasion for a friendly get-together. Participants will be asked to donate towards the costs of the event (suggested donation £5 for a member of ABS, £7 for a non-member, children go free). This entry was posted in ABS and tagged belarusian language, belarusians in london, marian house. Bookmark the permalink.